the vanity table is really big! the top of it is glass right? Yeah! And even though I got back a long time ago I still feel so slow in blogging.. I guess I'm lazy as well as busy. 94 is hefty! How long do you think it'll last? Keep us updated on whether this fails or lives up to the price! Gotta try that Fekkai hair treatment! I'm like you. I love your vanity table! So cute yet efficient. :) That Fekkai treatment sounds really interesting..
man, cleaning takes forever.. hahahaa. I am totally loving your new makeup "station"!! Lovely!! My friend has the same table from Ikea and its amazing!! I hope that your hair gets better!! I know the same thing happened to my sister when she was visiting Dubai for a bit..it must be the water!! Awwww, I LOVE your vanity!! I was actually just thinking... since SO moved his desk I could have one if I wanted lol. It'd be bad though, b/c then I'd have more space for everything. Yours is SUPER cute though! I've got the same problem... my hair drops like no other. A friend told me it could be due to the drinking water having too much chlorine or something. But, a reparative treatment on processed hair is always good! 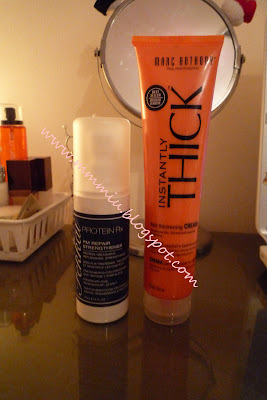 I have the Fekkai Protein Rx deep conditioner and so far I like it. At first I was a bit iffy about purchasing it cause of the HUGE price tag for such a small tub of product, but the results are really nice. Does it smell weird, the Fekkai treatment that is? Because my mom bought me an all natural hair strengthener that smells like petrol. It works, but I smell like gas while I apply it. Thanks for sharing your review on the Fekkai Protein Rx hair treatment, I've been using the Phyto revitalizing shampoo which works quite well for fall out as well. That's a pretty good vanity! I'be been looking for a new one but Ikea's last collection was way to stingy on storage. This seems like a good solution. I love vanity tables....can't wait to get my own, if I ever move out of my current place! I may have to try that Fekkai treatment if my hair gets damaged again this winter. u have the prettiest table I've seen! so cute!! 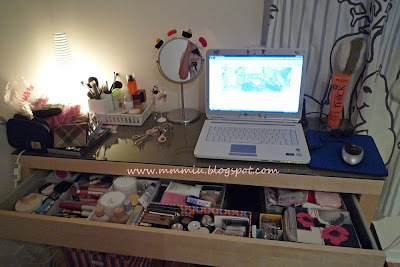 love your vanity table and all your stuffs there! :) super cute!! Ooh thanks for the heads up about this product. The same thing has been happening to my hair since I moved to Japan. All this fallout is starting to scare me!